We're heading towards the end of another year and we figured we'd give you a little update before we dive headfirst into a new decade. True Colors started out in 2004 and as we enter the sixth year of our existence, we realise we have outlived many great bands. 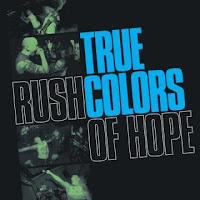 However, True Colors too has decided to call it a day in May 2010. We have achieved way more than we hoped to achieve, and experienced way more than we hoped to experience. We feel like True Colors has run its course and we decided to call it quits while we're still ahead. We will play a last show on May 22nd in Mol at Gompelhof, Belgium. More info about this final show will be announced soon. At this show, we will release a new 7" EP which we will start recording in February. Right after the recording sessions, True Colors will be joining Floorpunch on their first European tour since 1999. From March 25th till April 11th we will do a US tour with Mindset that will start at United Blood Fest and will end at React Fest, and in late April True Colors will play a couple of shows in Russia. More info about the tours, the final show and the upcoming new EP will be announced when it's due, but for now just make sure to mark May 22nd on your calendars!